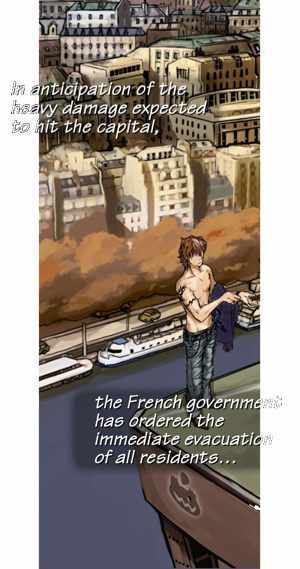 With Imaginary Range, Square Enix has released an interactive manga on the App Store. At first I was a bit puzzled to find out Square’s mysterious new project is basically a manga, but if you think about it for a second, it’s actually a great match. After all, Square Enix is also behind the epic stories in the Final Fantasy series. And lately, Final Fantasy focused more and more on a cinematic story. So, what is Imaginary Range? I’d say “interactive manga” describes it quite well. It’s basically a manga with story related mini games that you will have to complete to keep the story going. The mini games are quite fun and there’s a bunch of them to make sure it doesn’t feel too repetitive. You’ll have to guide missiles to hit weak spots on an enemy, clear levels with a laser or find special items in a picture. Imaginary Range starts in the middle of an action sequence and you’ll be left wondering what the heck is going there. The story is interesting and unfolds nicely. On top of all of that, it’s free! If I had to put down a bet, I’d say Square released it for free to make people familiar with the concept and later on add In-App Purchases for new issues, or offer them as separate apps. All in all, this is a pretty cool app if you’re into mangas. And if not, you might want to give it a try anyway, even if it’s just to see how Square tries to evolve the medium.